This functionallity is only available when the administrator has added the portfolio to your features. You will get the opportunity to present your results in and outside of aNewSpring. 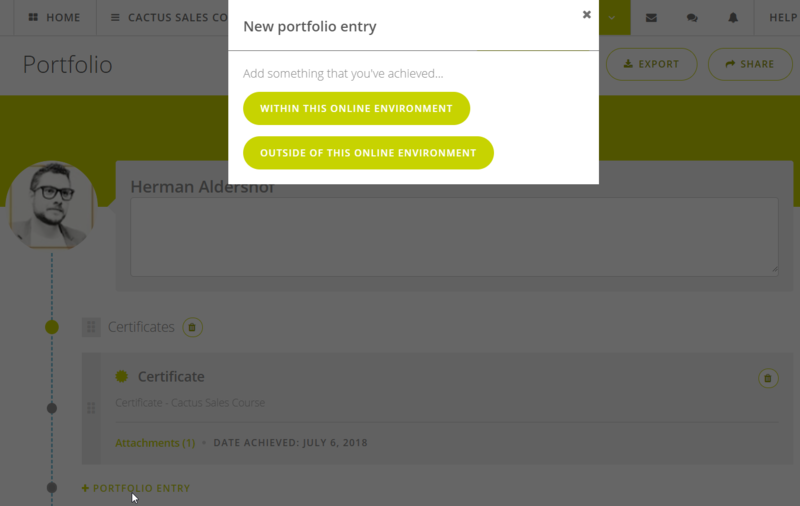 The portfolio can be filled with all kinds of results, for example diplomas, certificates, attended events, results of exams, assessments or other kinds of activities, etc. You can choose to share the portfolio with other people. You can demonstrate that you are qualified for your position. A place is created to present work and reflect on it. You can click on your name and then Portfolio. A first item has already been added that gives an example and short explanation about how it works. 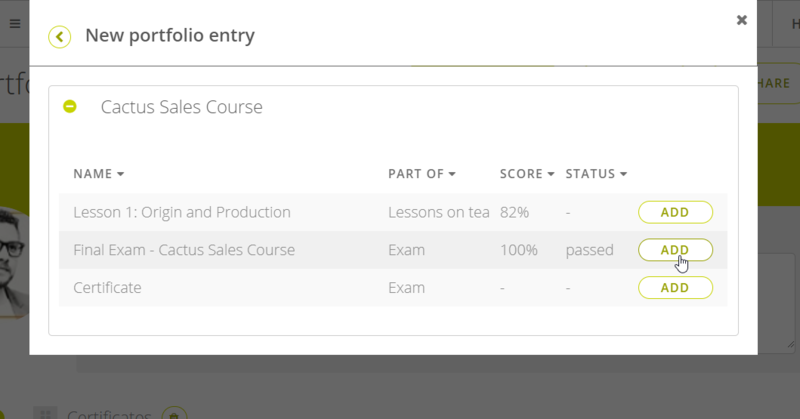 By clicking Edit, items can be added and sections created. There is space to add a biography next to the name. 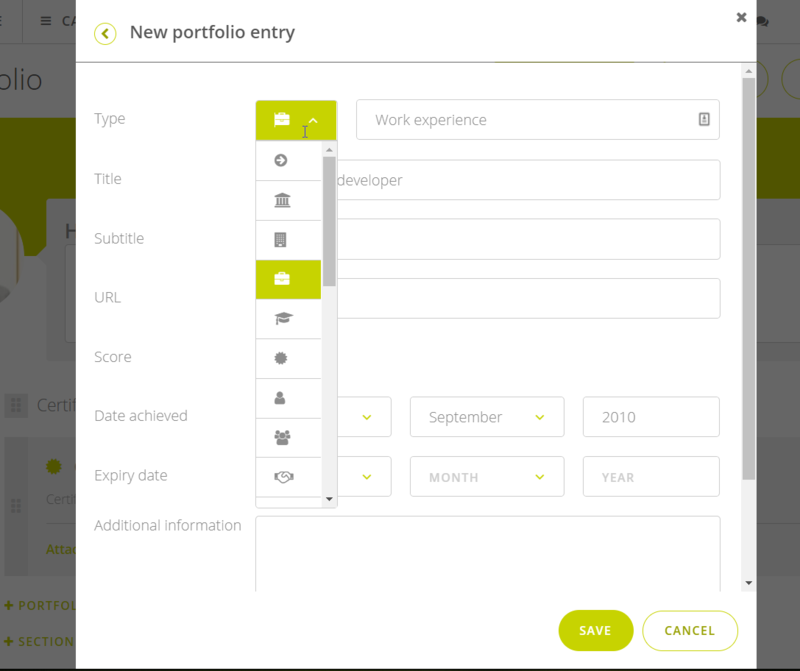 You can neatly categorise the different portfolio items using the sections. 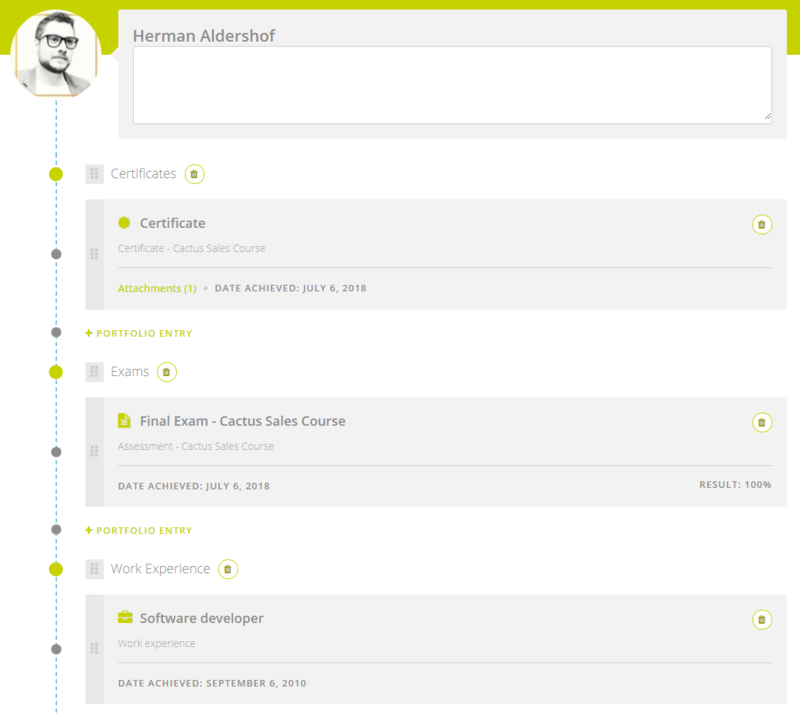 For example a section for certificates, events and passed exams. By clicking the Section title, these can be edited. Click the + Section button to add more. An item can be all kinds of things that you are proud of: achieved certificates, passed exams, attended events, read books, etc. If the new item has been achieved within this online environment, you will only have to click Add. The only thing to add would be a description. If a new item will be added from outside this online environment, a form will have to be filled in. Using the dropdown menu, another icon can be selected. By default the type is set to Custom, but this can changed to e.g. Work experience as in the example below. The button Done editing makes the portfolio definite and you can view it as a whole. By default the portfolio is hidden to the outside world, but you can share it with whomever they want. To do this, click the Share button. Click Generate link to create a link that can be shared with anyone that should be allowed to view the portfolio. You can always delete this link and hide the portfolio again. A newly generated link should be shared again. Also your instructor can only view the portfolio once they have received a link from you. You will have the possibility to attach the portfolio to a letter or resumé by clicking Export. This can give a detailed overview of the educations and achieved results.